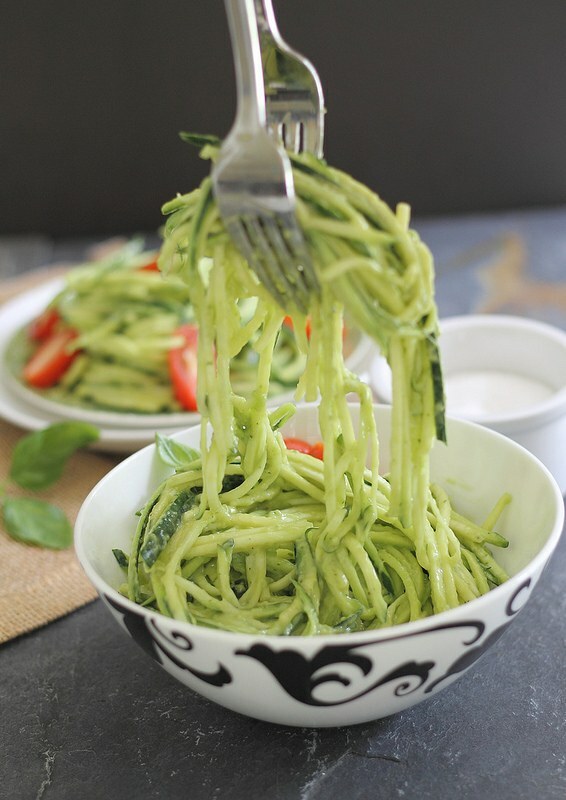 Zucchini noodles with avocado cream sauce makes a perfect side dish or light meal for summer. Add some grilled shrimp or chicken for a heartier meal. *This post has been updated (7/5/2017) to include a video (scroll down to watch). The video uses a spiralizer versus the julienne peeler I used in the original pictures. Feel free to use either tool for your zucchini noodles! It’s been just over a month since Ulysses got home from the police academy and is now around all week again. Well, “around” is relative with 12-hour shifts, but from a cooking perspective, he’s eating meals at home more or less. And among all the adjustments that take place when you go from 1 to 2 people living in a house, the food thing has definitely been one of the harder ones for me to get used to again. OJ containers are finished in 3 days flat..
Every meal is followed by a “second meal” of either cereal, oatmeal or a pb&j sandwich. Bacon and eggs need to be replenished twice a week now. I won’t even get into how annoying it is that all this food can be consumed with absolutely no repercussions on the scale for a certain someone…. So, here I’ve been trying to “bulk” up meals for this bottomless pit known as my husband and guess what that means? So I had a get real conversation with myself, told Ulys that I’m done playing the European “shove everything you can eat in your face” wife role and going back to cooking how I normally would. Which brings us to zucchini noodles. Last week, I would’ve boiled up some water and thrown in some whole wheat Barilla thinking it would be a more satisfying meal for that man I live with. This week, I’m happy with my julienne peeler + zucchini and a creamy avocado sauce that’s the perfect way to celebrate what summer has to offer. Zucchini noodles are all the rage lately and they couldn’t be an easier base for so many easy healthy recipes! The cheaper (although a bit more tedious way) to make zucchini noodles is with a julienne peeler. I have had that one for years and its done me well. It gets the job done producing straight strands of zucchini noodles (or whatever other vegetable you use it on) but it has its limitations. 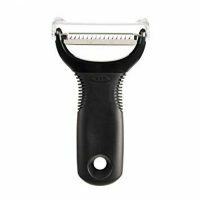 The julienne peeler really only works well on soft fleshed vegetables and it will take you some time as its a pretty manual process. Recently, I upgraded to a spiralizer. It’s a bit more expensive but a much more heavy duty gadget. It gives you 4 different shapes of noodles (including the classic curly-q you see in this squash noodle recipe and works on almost any squash, vegetable and fruit you can imagine like in this winter root vegetable salad this yogurt tahini Mediterranean carrot salad or these garlickly butternut squash noodles. 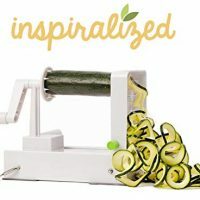 The pictures in this post show the zucchini noodles made with the julienne peeler but the video shows them made with the spiralizer so you can get an idea of the difference. Once you have your zucchini noodles made, whichever way you decide to do it, the avocado cream sauce comes together in just minutes! Also try Thai chicken zucchini noodles or Chinese chicken zoodles (<– zucchini noodles “other” name). You throw everything into a food processor or blender until smooth and that’s it! It’s refreshing and creamy and you can really use this sauce as a base for so many things. It’d be great on grilled chicken or fish. I tossed the sauce with the zucchini noodles, added some cherry tomatoes and ate this as a light meal. If you wanted to add some protein, any grilled meat or some shrimp would make this a well-rounded meal. If you love this recipe, make sure to also check out creamy tomato zucchini noodles for another easy zucchini noodle recipe idea. And don’t miss creamy pesto spaghetti squash noodles either! Zucchini noodles with avocado cream sauce makes a perfect vegetarian side dish for summer. Place zucchini spirals in a large bowl. In a food processor, combine the remaining ingredients and process until smooth. Toss the zucchini with the avocado sauce until fully coated. Garnish with cherry tomatoes and basil leaves, season with more salt & pepper to taste. I’ve still got to try zucchini pasta. I bought a spiraliser but it was a really cheap one from China that didn’t work. I need to buy a proper one so I can make this! Cuisinart makes a good one, manually opporated. I got mine from Costco for about $20. I bought mine in Kohls $19.99. It’s small round and works well with the right size veggies. Looks amazing Gina! Love the avocado sauce. My husband is the same way. He eats pretty much everything I put in front of him. Josh is the same way – mini meal/snack post real meal. It’s crazy. I don’t know how they do it! That creamy avocado sauce sounds just perfect; can’t wait to give this a try. I LOVE how creamy this is!! Definitely perfect for summer time! Yes. This dish is so summery looking. I have been dying to get my hands on a julienne peeler. I really need to get online and order one. I will not suggest the Pampered Chef model–don’t like mine. Oooo yum I would add chicken to this – perfect meal! thanks for the idea! pinning now. mmm! i love using zucchini for “noodles” for salad! I need to get myself a julienne peeler stat! This “pasta” is so perfect for summer. Loving the sauce! i been looking for ways to make zucchini pasta and this sounds heavenly. Hi Gina! This looks divine! I love doing zucchini noodles. I’ve been thinking about doing a creamy avocado sauce…I’m wondering…do the leftovers brown as a regular avocado would? To SANDRA —- Sorry, but to some of us, the carb and fat count absolutely DO count !! Anyone who is diabetic or pre-diabetic as well as many on strict cardiac diets , HAVE to be aware of their total intake of carbs for each meal as well as their total fat intake, in order to do their part to stabilize their glycemic index. For us, it’s NOT about weight loss, it’s about managing our body’s proper chemistry and digestive functioning. Yes, most vegetables and some fruits are “free foods” , but the amount of natural sugars, aka carbs, are vitally important for us to add in to our daily intake, meal by meal, to be able to maintain a fairly consistent glycemic level. The high fat content of the avocado, albeit healthy fat, is important to know, and using coconut milk instead of almond milk also adds fat and carbs. Therefore, for those of us who are conscientious about our food intake, please be aware that we are ALWAYS looking for these details on everything we eat. “When eating raw fruits and veggies eat till full” does not and never will apply to the millions of Americans that have these health issues. Following your advice could make them ill —- NOT healthy! This zucchini pasta is awesome. I can’t wait to try it out. This is gorgeous, Gina. I love the coconut milk twist in the sauce, too. Sounds amazing! This looks so yummy! And with all the zucchini coming my way I need new ways to enjoy it. Looks absolutely divine. Will have to try… I can only eat so much spaghetti squash, lol!!!! Hi there- stumbled upon you through your zucchini bread- I’m on my 2nd loaf in 2 days… And still have plenty of zuchs to try this too. I do a lot of raw strips with a vinaigrette but haven’t actually tried it as a “pasta”. It’s on for tomorrow night. Loads of basil in the garden too and I might do it with an almost real pesto. i really enjoyed your blog and found some of your recipes and ideas truly inspiring. it´s not europeans that “shove everything you can eat in your face”, dear, it´s the proud people that gave the world the expression “obesity epidemic”. hence the expression. “european wife” s aren´t the root cause of your weight issues either, that one lies a lot closer to home. see if you can spot it. “I live with a primate”.. oh, my, this was too good! This sauce / dressing looks fantastic. Do you have any idea how long it would keep? (I cook for one) Thanks! It never lasts long here, but I’ve kept it for up to 3 days in the fridge. It doesn’t oxidize and turn brown as much as you’d expect with avocado surprisingly. Any substitute for the cucumber? I’m allergic. Tia! It’s really just to make the cream sauce a little thinner so you can try some extra lemon or even just a bit of water. Had this for lunch today with cucumber noodles – so yummy! Thanks! This looks delicious and so healthy! I love delicious and healthy combined. This is a perfect recipe for me to try when my husband goes fishing. That’s when I get to eat anything I want. For him, I would have to grill some chicken on the side. Thanks for sharing! Have just tried this recipe after trying to find recipes using avocados (have only just recently tried them) and it is delicious. Have just made a batch for work tomorrow, it’s great that it’s eaten cold as I’ve been struggling to take something healthy for work. Love it! Ive never eaten zucchini raw and am tempted to steam the “noodles”. What do you think? I was wondering the same thing! I felt like I missed something in the recipe! The cooking park was skipped. That’s why I’m here reading thru comments! So I guess I’m not the only one that noticed that. Gina, can I just say I pinned this recipe on Pinterest and it went VIRAL. I had to change my settings because I was getting so many emails of people re-pinning this post. You are a talented cook and photographer! Pingback: 50 Zucchini Recipes - Chocolate Chocolate and More! 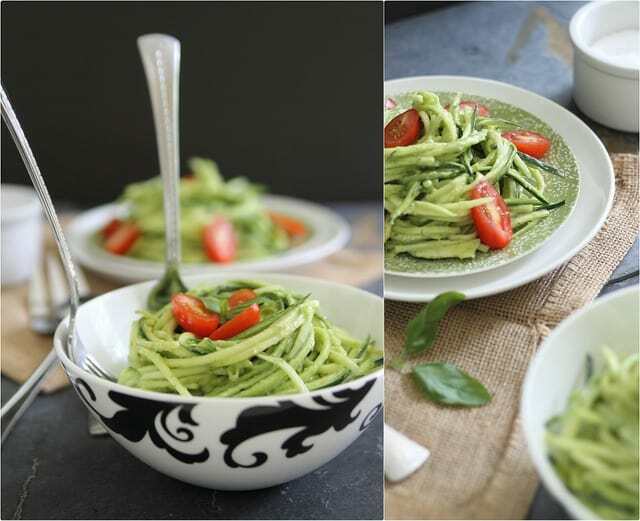 Pingback: Creamy Avocado Pasta with Basil and Tomatoes | Gluten-Free! Do you eat this cold or heated up? that’s exactly what I was wondering, so thank you. Glad I read down to your question. Do you cook the noodles before you add the sauce or is this just a cold dish? I usually blanche my zoodles for a minute thirty before I add the sauce but I’ve seen some recipes that just call for the noodles to be used as is after you spiralize them. In this recipe, no but you definitely can if you want to take a bit of the bite out of them. This looks good. Has anyone calculated the nutrition info., , i.e, protein, carbs, fat, calories? So, are the zucchini ‘noodles’ cooked first or raw? Thanks! no, you don’t need to cook them. The recipe has them as raw. That said, you can definitely blanch them quickly if you prefer. ; ”’fOR SURE ALL THE RECIPE3S WITH AVOCADO WILL BE BENEFICIAL TO EVERYBODY EVERYWHERE AND ANYWHERE BECAUSE AVOCADO IS ONE OT THE BEST FRUIT IN THE WORLD BUT WE HAVE NTO GET IT RIPE. My name is Sarah and I am a Production Editor at Everyday Health. 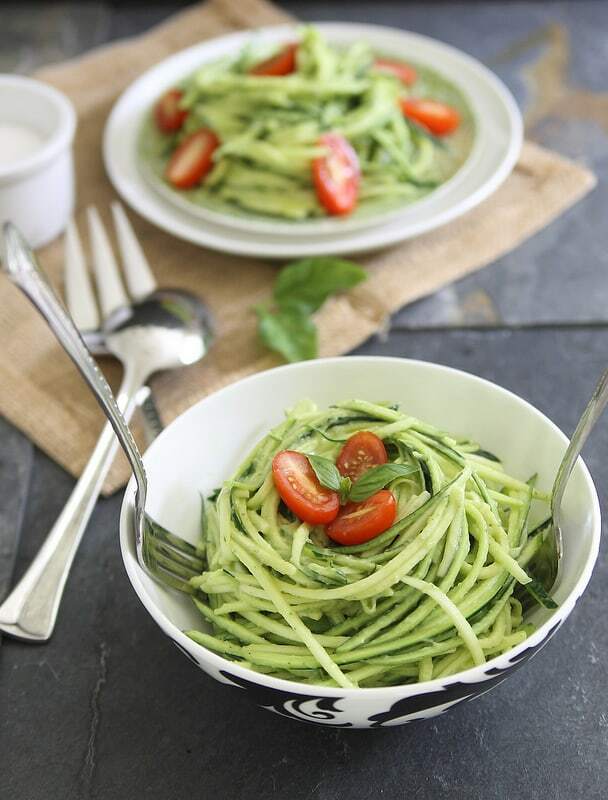 We love your blog and would love to feature your Zucchini pasta with avocado cream sauce recipe, https://www.runningtothekitchen.com/zucchini-pasta-with-avocado-cream-sauce/ for a “Zucchini Any time of Day” Recipe post we will be running in a few days. We would love an answer as soon as possible! We would link to your blog in the article, give it a shout out, and use the featured picture provided on your blog. We would need your permission to do this. You can reach me at skelleher@everydayhealthinc.com to discuss any questions you may have. Please let me know as soon as you can. We’re excited to hear from you! This will be the first recipe i will try with my new spiralizer. It looks delicious and healthy also for kids. Really good! Added a lot of hemp seed as garnish for extra protein. Can you use skim milk instead of the other milk? I have problems with the others. There’s only 2 tablespoons so I think you’d be fine with that substitution. This was the perfect recipe for summer. I have a silly question. From the video it appears that the avocado is halfed and blended, skin, pit and all. I’m assuming it’s just the fruit that is added, right? Thanks for sharing this delicious looking recipe! Yes, just the fruit. When the avocado is thrown into the food processor bowl, you can see the pit and skin have been removed. So you don’t cook the zucchini? Made this for a side at dinner tonight. I realized we ate all of the tomatoes over the weekend, so I drained a can of Rotel and mixed it in! The peppers in the Rotel added just a little spice! And I didn’t realize until afterwards that I forgot to add the milk. It turned out just fine without it! Do I need to boil the noodles? No, you can eat them raw. I wil try this recipe tonight but I’m also adding mushrooms and toasted pine nuts. Looks great. Thanks for sharing. Sounds like some great additions, hope you enjoyed it! I ended up making this hot. I did add the sauteed mushrooms and the toasted pine nuts and stir fried it quickly in a pan. My husband and I liked it a lot. Thanks for the inspiration! sounds like a great variation on it, glad you enjoyed! Really tasty and perfect for a hot day when you don’t want to turn on any extra heat in the house. Great way to get in a lot of veggies without too much fat. The cucumber is a great idea to reduce the fat in the dressing and make this even more refreshing. Me and my husband loved this. Could this also be done with crookneck squash? We have the spiralizer attachment for the Kitchenaid mixer…love it for big jobs like this..otherwise I use my julienne peeler. I can’t tolerate coconut or almond milk what do you suggest for a substitute? Whatever milk you can tolerate is fine. OMG! I enjoyed this recipe so much. The cucumer makes the sauce very refreshing. I had to post this before I go for my second plate???? Thank you!! Wait – so you don’t cook the “noodles” at all?? No, you don’t have to cook them. You can if you’d like but they’re fine to eat raw. I’m not a cook, and this turned out really yummy and it was really easy to prepare! I’ll be making another batch to take to a potluck next week. It’s going to be a hit! Thanks for the recipe! Do you have any favorite add ins, other than the tomatoes? Love adding some protein and making a meal of this – rotisserie chicken is easy! I would love to have your cookbook but I don’t see one on your website. Do you have one? Thank you for all your wonderful ideas. I’m celiac and always looking for make it from scratch interesting recipes. You are incredibly creative. Blessings in abundance – love what you are doing! This recioe would make an excellent side dish to a serving of chicken breast or salmon. Not enough protein to be a main dish – however if you’ve had enough protein the rest of the day, it could make a nice light supper. ???? I’m confused. In the video you throw in the whole bulb of garlic but in the directions it calls for 1 clove. Did I miss something? Which is correct? It’s just one clove. The video shows the whole bulb close to the camera so you know it’s garlic, but only 1 clove goes into the food processor. Has anyone tried the frozen/steamable zucchini noodles with this recipe? Wondering if you just let them thaw so they aren’t cooked. Thoughts? I haven’t used those but I’m sure they’d be fine. There’s no issue steaming/cooking the noodles first if you’d like. Just be careful to not overcook, a quick saute or steam is all they need otherwise they give off a lot of water. Hi, I’m lazy and buy my zucchini already spiraled. Can anyone give me an idea of how many cups of spiraled zucchini would be equivalent to what this recipe is calling for? Haha, love it! I’d say 2 large zucchini is probably about 8 cups of loosely packed noodles. Doesn’t need to be exact though. Do you have any suggestions of why could be used in place of the almond/coconut milk? We had this for dinner tonight. Made it hot and also warmed up the avocado sauce. It turned out fine. Did a side protein of chicken on the grill. My husband is diabetic and trying to eat healthier. I have been eating more of a vegetarian diet because of cholesterol issues. This was really good. Will definitely make this again. Thanks for posting.